An electric guitar is an exciting way to break into the music world — it gives you the freedom to play everything from jazz to hard rock, so you can express yourself in a wide range of musical styles. But if you’ve never played before, it can be difficult to figure out which instrument is right for you. Choosing an electric guitar for a beginner depends on a variety of factors. First, for many people, is price. How much do you want to spend on an electric guitar, especially knowing you may not decide to stick with it? Then, you should consider the size, as well as the number of cutouts — the curves in the guitar body that allow you to reach the frets. Another important consideration is the style of the guitar. If you buy a model that you love, and that suits the style of music you want to play, you might be more likely to stick with it. If you’ve started to look at electric guitars, you know that there are many options on the market. When you’re just starting, the sheer volume can be overwhelming. To help, we’ve done the legwork for you. These are our favorite five electric guitars for beginners; they’re a great place to start your search. With its full-size body, this LyxPro Starter Kit is a great option for adult players. It comes with a variety of supplies to get you started on your guitar-playing journey, including picks, a shoulder strap, and a carrying case. We love that it comes with an amplifier — this is something you need to get started playing the electric guitar, and this way, you don’t have to buy a separate amp. The guitar itself is sleek, with a classic shape. The curving body makes it easy to reach your hands to the strings and frets. The black and white color scheme looks great, whether you’re playing in your basement or planning to use the instrument in concert. It’s crafted with a rosewood fingerboard and a Canadian maple neck for excellent durability and sound quality. With the volume and tone controls, you can customize the sound to suit your space or your preferred style of music. When you’re just starting out, this guitar kit performs well. You can use the tuner to get the strings in tune, or experiment with your sound using the tremolo bar. As you get accustomed to playing, you may decide to replace the strings and picks. Strings may not be adequate as you advance. If you’re dreaming of playing in a rock band, this Davidsons Guitar is a great option. It comes with a humbucker pickup — a special set of coils that cancels out the interference in the tone and gives you a rock sound. The guitar also comes with an amp that features an Overdrive button, which distorts the sound and allows you to create a more intense sound on the choruses of your favorite songs. This starter package, which is specifically geared toward beginners, comes with all of the things you need to get started with the electric guitar. In addition to the guitar and the amp, you’ll get a gig bag, a strap, and a cable that connects to the amp. The included picks and pitch pipe help you play and tune the strings. 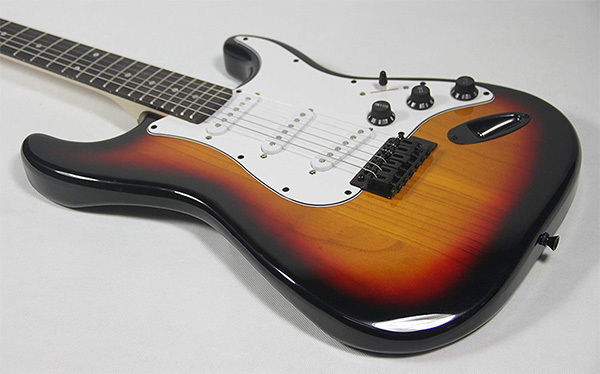 Built with a maple fretboard and neck, this electric guitar is designed for a powerful sound. The maple-maple pairing creates a clear tone with a solid foundation. Since the maple is strong and dense, it creates a guitar that’s tough and well-suited to fast, aggressive playing. Maple construction for a clear, strong sound. Humbucker produces classic rock sound. May need a string adjustment for the best sound. If you’ve never played the electric guitar, you probably don’t have any of the supplies you need. That’s where this Donner Pack comes in handy. 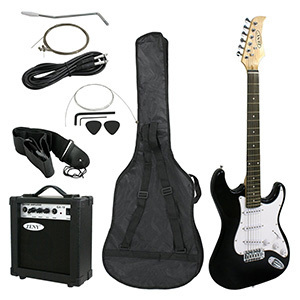 In addition to a full-size electric guitar, it includes an amplifier, a strap, and a case. A set of strings, cable, and picks complete the package, giving you a complete set of supplies. Built in a classic shape with simple black and white coloring, this guitar looks right at home in a rock band or a jazz combo. The guitar’s body is made from basswood, an affordable material that creates a broad, balanced sound. The Canadian maple adds a crisp, clear tone, for a result that’s pleasing and even. The finishing touch is the ebony fingerboard, which looks beautiful and adds a hint of brightness to your playing — ideal for articulating fast runs. On the body of the guitar, you’ll find a pickup selector switch and two different tone knobs, which make it easy to customize your sound. The built-in volume controls make it easy to increase or decrease the audio, whether you’re practicing or playing with a group. Plus, with the steel tuning pegs, it’s easier to get your strings vibrating at the correct frequency. The C-shaped neck profile fits smoothly into your palm, creating a comfortable playing experience. Includes amp, bag, and supplies. Steel tuning pegs for accuracy. Some users report issues with the amp cable. With its blue, black, and white coloring, this ZENY Guitar is designed to stand out; it’s an ideal choice if you’re looking for a strong aesthetic. This right-handed guitar comes with all of the accessories you need to start, including an amp, cable, strap, case, and cables. You’ll also get a set of steel strings, so you can test out your new instrument as soon as it arrives — no need to wait for other supplies to arrive. On the body of this guitar, you’ll find all of the controls you need as a beginning player. The volume control helps you control the decibel level, which is ideal if you’re practicing in an apartment or a shared house. With the treble and bass controls, you can adjust the quality and balance of your sound. The neck of this guitar is crafted from maple; this sturdy wood creates a pleasant, clear sound that can help you hear tonal shifts as you learn to play. Combined with the solid wood body, the maple delivers a smooth, responsive playing experience. The durable top profile features fine curves that are engineered to support maximum control. As a result, you can play this instrument when you’re standing or sitting with ease. Includes a set of beginner accessories. Curved profile is easy to play. Some users report problems with amp connection. Do you have a larger frame? If so, this Best Choice Products Guitar might be a good fit; it’s a 41-inch model, so it gives you a little extra playing room. It features a classic electric guitar design, complete with 22 frets, so you can tackle a wide variety of styles. The frets are designed specifically for easy, mellow playing — perfect for new players. This bundle includes all of the equipment you need to start practicing your new guitar. The included amp features a connector for a guitar and a microphone, which is handy if you plan to play and sing. The strap helps support the instrument when you’re sitting or standing, and the strings and picks allow you to set up the guitar immediately. When it comes to playing the guitar, controls are important. This model has you covered. On the amp, you’ll find controls for volume, treble, bass, and drive; as a result, it’s a breeze to experiment with different settings as you develop your own signature sound. Plus, since the amp runs on batteries, you can practice anywhere in the house. Three single-coil pickups deliver a balanced sound to the amp. Solid wood body for a balanced sound. Included amp allows easy sound adjustments. Included accessories bundle gets you started playing quickly. May not be suited for advanced beginners. No matter which of these guitars you choose, you’ll get a full set of accessories that make it easy to get started. Our top pick is the LyxPro Complete Beginner Starter Kit; with its quality construction and beautiful design, it’s a versatile option as you’re getting to know your personal guitar-playing style. Check out the guitar today to start your musical career. If you want to learn how to play the electric guitar, a beginner set is a great place to start. These instruments are usually shaped for easy playing, making them accessible for new players. Even more importantly, they include the supplies you need. As you look at different options, consider the following factors in your choice. Although the style of a guitar may seem superficial, it can have a big impact on your playing. If you choose a guitar that looks beautiful and suits the image you have in your mind of a guitar player, you’re probably more likely to be excited about practicing. Since practice is essential to getting better at the guitar, style can be a powerful motivator. Don’t be afraid to choose a model that calls to your visually. Playing the guitar requires more than the instrument itself. You also need things like strings, picks, and an amp before you can make a sound. At a minimum, you should look for a guitar that comes with those items, as well as a cable, a strap, and a carrying case. You may also find sets that include tremolo bars or capos; these items aren’t necessary for beginners, but you may be able to use them as you improve. The shape of a guitar is part of its aesthetic, but it can also affect your ability to play. Look for top-profile curves that allow your hand to reach the frets easily. This is especially important if you’re a smaller player. Guitars that are designed for beginners usually have generous, finely crafted curves and durable bodies. In the end, choosing an electric guitar is a highly personal decision. By aiming for a mix of price, style, and design, you can select an instrument that grows with you as you become a more skilled player. Dav​​ison Guitars, Offical Brand Website. Best Choice ​​Products, Offical Brand Website.